Ambrosia® fondant bee feed dough is a paste-like compound made of micro-fine sugar crystals, which are surrounded by a syrup film made of different types of dissolved sugars. 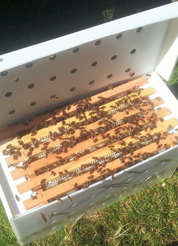 The syrup film prevents the crystals from being encrusted and enables easy acceptance by the bees. Because of its low water content, ambrosia® bee feed dough has a shelf life of 24 months in ideal storage conditions. It is ideal for early winter feeding or feeding during a shortage of food. Each pack is 2.5kg. Also available in 12.5kg boxes, each box contains 5 blocks of 2.5kg. For pallet deliveries 64 boxes (5 x 2.5kg) please contact us for a quote.